It’s that time of the year when mornings are met with crisp autumn air, when scarlet and amber leaves crunch beneath your feet and when restaurant menus are filled with everything pumpkin spice. We may welcome the pitter-patter of trick-or-treaters knocking at our doors, but there are also unexpected and unappreciated guests sneaking into our homes: stink bugs, ladybugs and other insects. What draws these creepy crawlers into our attics and kitchen cupboards, and to the space beneath our furniture? Not only are outdoor temperatures becoming colder, but days are getting shorter. Insects detect and respond to these temperature and light cues in preparation for winter. It’s an essential adaptive response since these insects are not able to cope with the cold. Insects take on some of the most creative survival strategies. 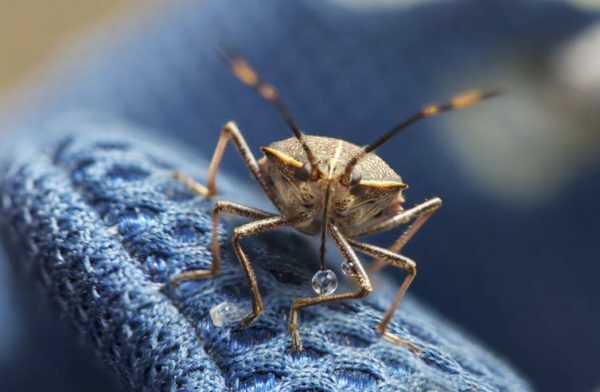 As the leader of the Stink Bug Project, I’ve seen how the invasive brown marmorated stink bug has overcome the challenges of our colder climate. Moving indoors during the winter has helped it spread across North America. Some insects, like monarch butterflies, pack up and migrate to warmer climates. Others stick around and brave it through the winter. Those that can survive outdoors may enter a type of hibernation referred to as diapause. These insects burrow into leaf litter, under loose bark and in some cases at the bottom of ponds or lakes that do not completely freeze over. The bodies of these insects will engage in biochemical changes. For example, some of these outdoor-dwelling insects may be able to resist freezing to death by producing special antifreeze proteins in their blood that prevent ice crystals from forming in their bodies and, by the end of a winter season, prevent tissue damage as a whole. The banded woolly bear caterpillar produces an antifreeze that protects its organs and soft tissues in the winter. Remarkably, some insects such as the woolly bear caterpillar are able to freeze solid during the winter as they tolerate the formation of ice crystals in their body. They accomplish this feat by using alcohol-based molecules to control where and how fast ice crystals form in their bodies. This strategy causes minimal damage to their cell membranes and cells as a whole. Then there are the insects like the brown marmorated stink bug that adapt to cold temperatures by seeking shelter in human-made structures. This can include hiding in our garages, sheds and, perhaps most disturbing, in our very own homes. It’s not uncommon to find an occasional insect or spider crawling around in our homes. Towards the fall, it becomes increasingly likely that you will be awash in unwanted guests sneaking into your home through openings you might not know about. As winter sets in, these insects tend to stay put and remain inside. Ladybugs overwintering in a window frame. Western conifer seed bugs, box elder bugs, ladybugs, cluster flies, stink bugs and many others like to move into our homes for the winter. As they do, they often secrete chemical signals called pheromones to attract more of their counterparts to the hibernation house party. It can be quite scary for home owners to come across a large mass of insects that have set up shop for the winter. I once visited a home where there were thousands of hibernating stink bugs tucked away under a sofa in the sun porch. While these insects are unlikely to cause a problem during the winter months (they mostly remain out of plain sight), you might start to notice them on warm sunny winter days and, as spring approaches, when temperature and sunlight cues break the insect’s diapause. That’s when insects start trying to get outdoors to continue their life cycle in the more pleasant spring and summer seasons. As a result, it’s pretty typical to see insects clinging to your windows, looking for a way out of your house. As we head toward winter, homeowners can minimize the number of fall invaders by engaging in a few proactive home checks. One of the most important things that a homeowner can do is to be sure that any cracks or crevices on the exterior are filled. Check for spaces along the roof, doors, windows and siding panels, around any wire or cable openings that extend indoors, and install insect screening on attic vents. While it may still be possible that some of these cold-avoiding insects will make it indoors, these preventative measures should significantly cut down on the number of unwanted insect house guests. Insects, however, are incredible organisms. They deal with oncoming changes in the winter season by engaging in many overwintering strategies that include, in the simplest of ways, seeking refuge in a cozy home. While increased vigilance might minimize the number of insects in our homes, it is certainly quite possible that our winter roommates are here to stay. And remember the next time you are home on a chilly autumn night, it’s unlikely that you are ever alone!